A growing number of nurse practitioners is answering the growing need for house calls. 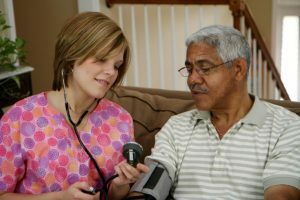 The number of nurse practitioners making house calls to older adults topped the number of physicians providing such care, says a study that also notes that state regulations make it hard for care providers to meet demand. The study looked at 2012 and 2013, when the change in the number of home visits went up from 4.9 million to almost 5.2 million. In 2013, nurses made more than 1.13 million house calls, up from 925,000 in 2012. Physicians made 1.08 million each year. The study—which is behind a paywall on the Journal of the American Geriatrics Society—also looks into Medicare payments for residence-based health care provided by nurse practitioners. The study shows that less restrictive Medicare rules, too, would allow nurses to do even more to respond to the health needs of older Americans in assisted living or at home. As this report on the AARP website noted in 2012 (written by Andrea Brassard, PhD, FNP-BC, FAANP, of the Future of Nursing: Campaign for Action), Medicare regulations often slow the process when it comes to people’s getting health care outside an office. Laws now dictate that only physicians can authorize home health services to Medicare recipients. Stay up to date on Campaign for Action news and learn how to get involved. Our vision: Everyone in America can live a healthier life, supported by nurses as essential partners in providing care and promoting health equity and well-being.